This will be my last post for a weeks or so as we are going away on holiday tomorrow. I have put a notice on my website to that effect as I shan't be able to send out any templates while I am away. 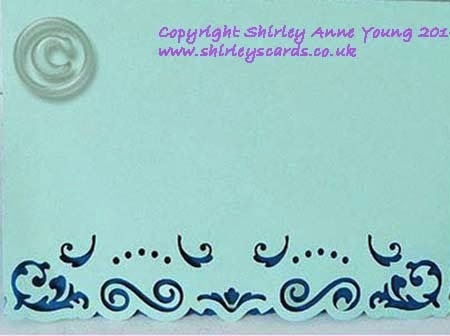 This freebie is a a generic card base with a flourish cut out edge for you to decorate as you wish. The photo isn't very good so I hope you like it. I shall be back home on the 23rd May and will try to catch up with your blogs then. The download links are below and I would love you to leave a comment if you download the template. Such a delicate and lovely edge. Thank you. Thank you so much. You are a very talented artist. Thank you for another sweet note card. Thanks for this Shirley will come in handy to do anything with. Thank you for sharing your beautiful card designs. Hoping you have safe travels. A lovely design, thank you Shirley. Very pretty!! Thanks so much! Thanks for sharing your wonderful templates. Can see plenty of use for this one!! I can't wait to cut this card. Thanks for sharing. This is one of the best collection of svgs on the Web, I've seen -- Thanks!